"Sony the Hedgehog´s adventures back on your PC"
Sonic is a world widely famous character in the video games market and the representative icon of Sega. It is a terribly speedy blue hedgehog that has to run through different levels at an incredible speed in order to destroy all enemies and obstacles that get on its way. 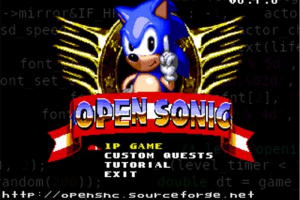 Now, thanks to Open Sonic you can enjoy the most famous Sega game from your computer again. This game brings the fastest blue hedgehog back in one of the most known adventures: Sonic the Hedgehog, which you might have played on any of the Sega consoles. Open Sonic changes some aspects of the original game and offers some variations. It allows you to play as Sonic, Knuckles or Tails. Each of the famous characters possesses a special ability, for instance tails can easily fly and Knuckles is capable of climbing walls. Moreover, Open Sonic has a levels editor you can use in order to modify the already existing levels to your preferences.